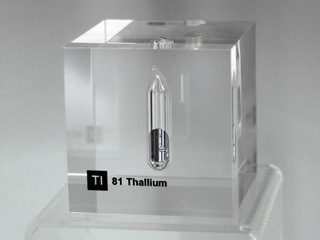 Thallium was discovered in 1861 by W. Crookes in London, and isolated by C.A. Lamy the following year in Paris. Thallium is a soft, silvery-grey, reactive metal which is only found as a minor constituent of various minerals (it has an abundance of 0.6 ppm in the earth's crust), from which the metal is obtained by electrolytic reduction in aqueous solution. Thallium tarnishes readily in moist air and reacts with steam to form TlOH. It is readily soluble in acids, particularly HNO3, and is highly toxic. 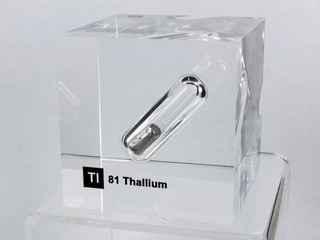 As a result of its toxicity, thallium is rarely used, with the exception of the manufacture of special grades of glass. In the past, thallium compounds found applications as diverse as rat poisons and hair restorers!